Chris Haikney writes of deconstructed toys and 7" biscuits. All in the name of art of course. Before anyone says "sound art? is that not just music? ": curator David Toop defines it as "art where sound is the primary carrier of meaning." Art and Meaning: no Robbie Williams then. The exhibition was packed with work, much of it specially commissioned and/or involving fairly famous names from the music world. 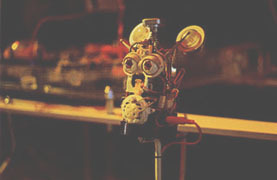 The pieces ranged from video installations by the likes of Scanner to noisy sculptures like the wooden robot that greets you with nonsense words. I'll get my criticism out the way first. There were two problems with the exhibition as a whole: sound bleeding across exhibits and a wallpaper tendency. These problems are probably related (to minimise the overspill you have to favour quieter works) but there was a definite bias. Also the work by the famous names was disappointing. Eno offers no surprises with his installation; I think a career in interior design is beckoning. Lee Sonic Youth Ranaldo's Hwy Song is obvious and shallow even by my standards. And Pan Sonic's 2 x 50 Hz thru Leslie Speaker is boringly literal, a manifestation of their early ultra-minimal work rendered leaden and static by the speaker's squat bulk. So what did I like? Disinformation's Artificial Lightning amplifies 12 flashguns as they recharge. This builds to a crescendo where the flashes all fire at once and capture your shadow on the phosphorescent wall. Initially threatening, with its echoes of Checkpoint Charlie and Hiroshima victims' shadows, when I go back the feel is completely different. A group of schoolchildren as young as six had come in and were making shapes on the wall, three at first then others from different groups. What was overwhelming and sinister viewed alone became harmless family fun. Pick your own metaphor. Christina Kubisch's Oasis 2000 out on the pavilion took the hackneyed old soundscape idea and gave it a twist. Stringing induction loops over the concrete space and playing different natural sounds recreated an unspoilt countryside in London. With a lion in one corner and a stream in another, it highlighted sound's role in creating a perceptual space. Either close your eyes and be somewhere else or look into the office next door and smile; every home should have something like this. Project Dark contributed three gramophone sculptures based on their series of singles pressed on unusual materials. In this case there was a biscuit, a piece of glass and a spark generator. A simple but brilliant idea for inspiring thought about media, materials and messages if you're that way inclined. But a merchandising opportunity missed by the cafeteria, there were no 7" biscuits for sale. I really liked Max Eastley's sculptures, but felt they were overwhelmed by their surroundings. They're so fragile that the sounds they make are lost in the rich soup of the gallery. I still found the sculpture where a stick through a chain tries to stay perpendicular to the wall (Architecture 2?) oddly touching, like watching a baby haul itself to its feet. Phantom Drawings of Mechanical Ghosts was another delicately poised work, as you pass the spindly figures they seem to whisper and get disturbed. By way of extreme contrast there was also Toyzone by Paulo Feliciano and Rafael Toral, consisting of various electronic toys stripped down and wired up. The soothing Furbish of the centrepiece becomes maniacal chirrups and flashing lights. The toys are made unfamiliar and disruptive but remain playful: it's always when you aren't looking that they seem to make the best noises. The sheer volume and variety of work in the show provided the value for money factor. Expand your sonic horizons for the price of your dreary local indie night! Fun for all the family! There wasn't a unifying vision or shared agenda among the artists but that'd be like demanding every painter used the same colours. What can be seen is that as art has to compete for shortened attention spans in a flashy world it can no longer ignore all but one of the senses and more use of sound can be expected. Chris Haikney recently left university with a degree in Procrastination and is looking for money. Or failing that, a job.